Saint Dominic’s chief glory among men lies in the broad and free spirit bequeathed to the threefold religious family of friars, nuns and tertiaries which perpetuates in our times the apostolate of spreading of the Truth and of fight against the errors and against those who spread them, inaugurated by him in the thirteenth century. What, then, was this spirit which he gave to his followers and which is the special mark of his genius ? Briefly, we may say the essence of this spirit is embodied in his intellectual ideal, which distinguished Saint Dominic among the great leaders who, by several fashions of religious life, have founded in the Church institutes to lead souls Godward. By no mere accident the motto of his religious family is « Truth », for this word touches the magic appeal of saint Dominic’s heart. Were we to choose a text to express the peculiar mold of his genius, we could find none better than the Saviour’s words : « The Truth shall make you free » (Jn 8, 32). He aimed at truth and attained freedom of soul. Consequently, he zealously fought against the errors which destroyed truth in the souls : a good pastor doesn’t only gives pasture to his flock. He also protects it against the wolves. If not, he cannot be called a good pastor. He is a mercenary ! 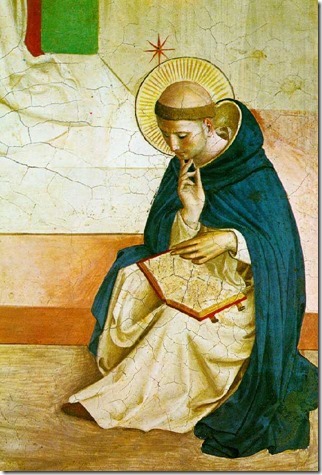 The long student life of Saint Dominic at Palencia (Spanish famous University of this time), his years of contemplation as canon of the cathedral of Osma (Spain), his apostolic preaching in Languedoc (south of France) against the Cathars, his dispersion of the brethren (August 15, 1217) to the University centers just after the foundation of the Order (December 22, 1216), and finally the astounding influence which his friars straightway exercised at these power-houses of learning – all these facts bring out strikingly clear the intellectual mission of Saint Dominic and of the Order he founded. And moreover, was it not this mark of his genius that, in the thirteenth century, charmed the most virile intellect of Europe, Saint Thomas Aquinas ? The secret of Saint Dominic’s holiness, then, was his fast-knit friendship with Christ, who is the Truth, the model of perfect spiritual freedom, the freedom of the children of God. unite us to the blessed ! O SPEM MIRAM, quam dedísti mortis hora te fléntibus, dum post mortem promisísti te profutúrum frátribus ! Imple, Pater, quod dixísti, nos tuis juvans précibus. V. Qui tot signis claruísti in ægrórum corpóribus, nobis opem ferens Christi, ægris medére móribus. Imple, Pater, quod dixísti, nos tuis juvans précibus. R. Glória Patri et Fílio et Spirítui Sancto. Imple, Pater, quod dixísti, nos tuis juvans précibus. Pleading for us with our Lord. Saint Dominic (1170-1221) was a canon regular in Osma, Spain. During a trip in 1203 in the South of France, infested at that time with Albigensian heretics, he realized that the keeper of the inn where he was spending the night was a heretic. Immediately he endeavored to convert him and, after a night of discussing, succeeded. The historians will mark this episode as a turning point in the life of St. Dominic. Soon after, Providence will lead the saint to dedicate himself to the conversion of heretics, and in 1216 he will found the Order of Friars Preachers, instituted from its birth for the preaching of doctrine against heresy. His burning desire was to save souls by liberating them from the principal cause of their perdition: error. For almost eight centuries, the sons of St. Dominic had continued to live this mission of spreading the truth in a world full of errors, exposing the mysteries of the Catholic faith and defending them against heretics and unbelievers. However, in the wake of Vatican II, this heritage was largely abandoned. 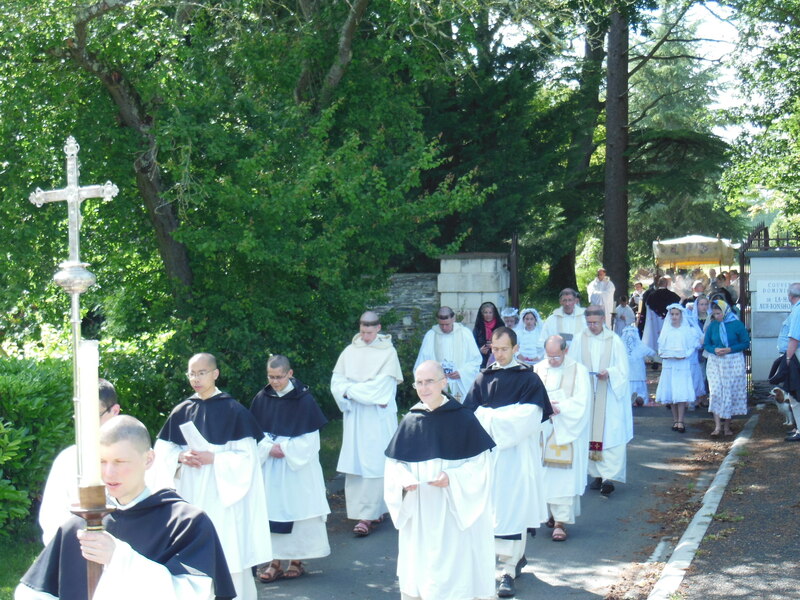 Our community was founded in France in 1975 with the goal of preserving the traditional Dominican life with all the monastic observances that have been the strength of our order since the beginning. 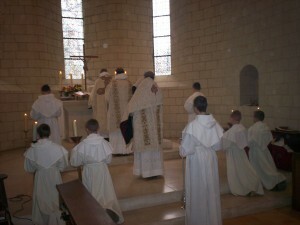 In particular, the liturgy is celebrated according to the traditional Dominican rite. With regard to the crisis in the Church, the community holds firm to the prudent policy of Archbishop Lefebvre: refusal to cooperate in any way with the modernist destruction of the Church, without falling into the [too] “simple solution” of sedevacantism. In 1981, it was Archbishop Lefebvre himself who received the solemn vows of our Father Prior. Today the community has members from Europe, North America, Asia and Australia. 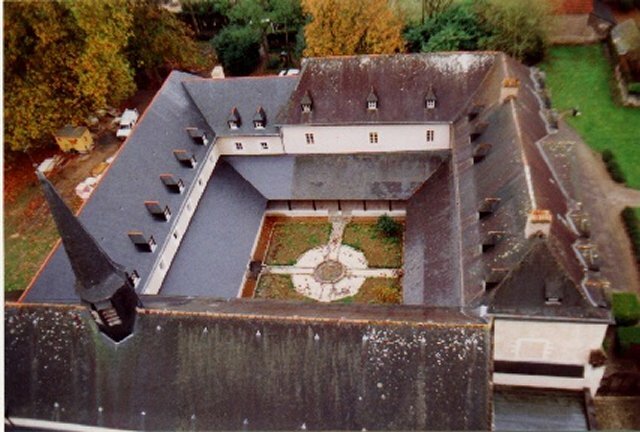 We are based in Avrillé, France (near Angers, 90 minutes southwest of Paris), in a former monastery of the Grandmontain Order (suppressed in the late 18th century). 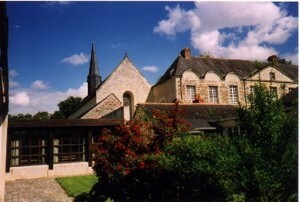 Our friary is a busy center of parish life, with an elementary school for over 60 boys and girls, and a boys’ high school with about 70 students. A few hundred feet away is the monastery of our cloistered contemplative sisters. True to the Dominican ideal, our apostolate is not limited to the little town of Avrillé. The fathers are regularly called upon to preach retreats and recollections, organize pilgrimages or participate in symposiums. In recent years, our fathers have made their voices heard throughout Western Europe, Poland, India, Africa, Australia, Canada and the United States. We also run a publishing house for the diffusion of books on doctrine and spirituality, as well as our quarterly review “Sel de la Terre” (Salt of the Earth), which treats of doctrinal issues, current events in the Church and in society, religious art and culture. 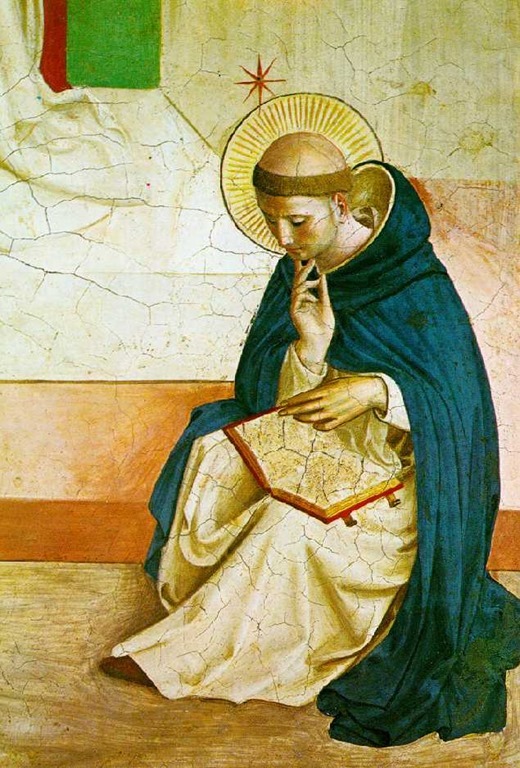 St Dominic’s rediscovery of the apostolic ideal in the thirteenth century is the stroke of genius that allowed him to re-launch mission activity in all of Christendom and beyond. What is this apostolic ideal? Modern authors often refer to this ideal as being a “mixed life” (that is, a “mix” of active and contemplative life), but this term misleads many into thinking that it is a question of a mere juxtaposition of mental prayer and preaching. The real apostolic life is nothing other than the life led by the Apostles, a life in which the interior contemplation of divine truth “overflows” into an apostolate of preaching which draws others to the same contemplation. This is very different from the mental prayer of an active religious before he goes off to care for the sick, teach, or even preach. In this case, contemplation is just one of the many means of personal sanctification subordinated to the particular goal of the institute: care of the sick, teaching, etc… It’s simply a preparation for the works of an essentially active life. Nor is this apostolic life the same as that of a purely contemplative religious, whose contemplation never leaves the cloister, so to speak. The Dominican “shares the fruits of his contemplation with others”, as St. Thomas Aquinas says. In other words, the Dominican ideal is a summit between these two types of religious life: the primary aim is contemplation, but contemplation that necessarily bears fruit in exterior works. In order to attain this ideal, St. Dominic adopted all the traditional monastic observances so conducive to meditation: the cloister, silence, penances, fasting, and the recitation of the entire divine office in common. However, he replaced the manual labor of the monks with the study of theology. What’s more, he incorporated the aforementioned practices into the rather flexible rule of St. Augustine. Thus, this truly apostolic life may be interrupted when it’s time to help our neighbor by preaching or teaching1. 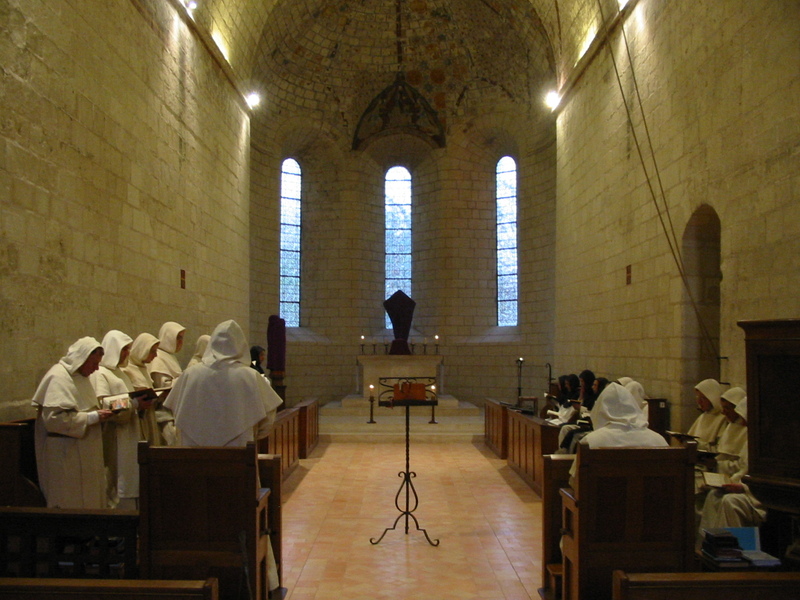 This particular way of life produces a specific apostolic activity: firmly rooted in a monastic atmosphere of prayer and the study of Catholic doctrine, the apostolate can never consist of anything other than the divine mysteries that we have contemplated in the silence of the cloister. Like St. Paul, the Apostle par excellence, we only profess to know “Jesus Christ, and Jesus Christ crucified”, not mathematics, chemistry or any other profane science. The Dominican motto is “Veritas” (“truth”). This signifies that our preaching concentrates first of all on enlightening the mind, rather than trying to convince the will. The goal is to explain and to help others understand Christian dogma. Once the intelligence sees what is true, the will is naturally attracted to what is good, and accomplishes it with joy. Here a certain myth must be dispelled regarding the spirit of the Dominican order. While it is true that the order has counted among its members a very large number of extremely erudite and learned scholars (for example, St. Thomas Aquinas, the greatest theologian Our Lord has ever given his Church), the Dominican order is not an order of intellectuals, and much less an order of “brainiacs”. Obviously, those gifted with a high capacity for learning will be naturally drawn to the order, given the fact that the Dominican life offers greater opportunities for study, but the Dominican habit is not exclusively reserved for them! Such an idea is contrary to the history and even the legislation of the order. A Dominican friar must prepare for a life of preaching with thorough and serious studies, but the intellectual requirements for a friar preacher are no more exacting than those for other orders or for secular priests. By the very fact of its preaching mission, the Dominican order is a clerical order, because such a mission in the Catholic Church is only confided to clerics. Therefore, entering the order usually means joining the priesthood. “Your Father Dominic, my beloved son”, God said to St. Catherine of Sienna, “willed that his brothers have no other thought than that of my honor and the salvation of souls, by the light of knowledge. It is this light that he willed to be the principal object of his order […] in order to extirpate the heresies that had risen up at his time. HIS ROLE WAS THAT OF THE WORD, MY ONLY SON…”. The Dominican life embodies the most complete imitation of the life led by Jesus Christ during the time of His stay among us. Priest, in order to imitate Our Lord Jesus Christ, who is the Sovereign High Priest. Religious, in order to accomplish his priestly functions more perfectly, and in order to imitate more closely Our Lord Jesus Christ poor, chaste, and obedient. The rule (and especially the deep community life of the friars) is an efficacious protection from the dangers inherent to the inevitably solitary life of many secular priests. Contemplative, in order to nourish himself on God, known through faith, just as Our Lord nourished Himself by the contemplation of His Father, face to face. Preacher, in order to carry out the mission of the Word. This does not mean, however, that lay brothers are excluded from membership in the Dominican family. Who has never heard of St. Martin of Porres, the great Dominican lay brother? Like the fathers, the lay brothers are full, first order members, and even “preachers”, albeit in a different way. First of all, their humble religious life is already a powerful preaching in today’s proud and naturalistic world, and a means of procuring many graces for the preachers and those to whom they preach. In addition, they have the important task of taking care of all the material aspects of friary life, which allows the fathers to devote themselves entirely to their studies and to their apostolate of preaching. Last but not least, they often accompany the fathers on their missions, for the same reason. In this way, every mission is truly a group effort on the part of the entire friary. The life of a lay brother is never dull. There are always things to be repaired, books to be translated, guests to greet, laundry to be done, car maintenance, gardening, carpentry and masonry, not to mention accounting and secretarial work! And of course, feeding a community of two-dozen brothers requires a certain amount of preparation in the kitchen. The monastery is even equipped with a traditional bread bakery to provide fresh, home-baked bread for us and for our contemplative sisters. In view of these duties, the lay brothers are exempt from the recitation of the divine office (except for the morning prayers of “Pretiosa”, and the office of Compline, which serves as evening prayers for the whole community). Their day is punctuated by the meditation of the Rosary and other private prayers that vary according to each brother. They also benefit from a weekly course in spirituality or doctrine. 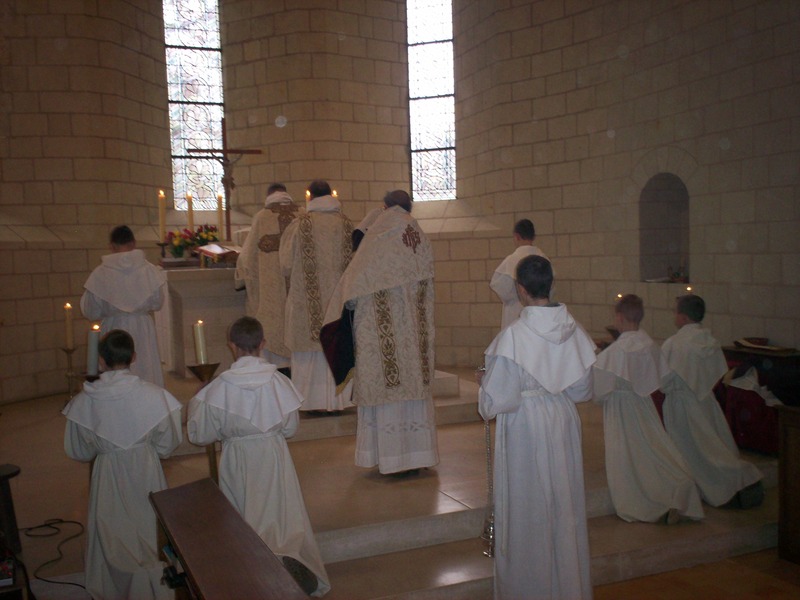 After having examined the spirit of the order in general, let us now take a look at the everyday life of a friar preacher at the friary of La Haye-aux-Bonshommes in Avrillé. Afterward, we’ll see what a typical preaching mission entails. The community rises at 4 o’clock (which is not so early when one goes to bed at 8:30!). Each has 20 minutes to dress, wash up and do a bit of gymnastics before going off to “work”, that is, the “opus Dei” or divine office, which starts with Matins. This is the most important of our monastic observances and a powerful aid to the contemplative life. This last point is especially true in the beautifully conserved 12th century church where we have the blessing to live our liturgical life day-in and day-out. Its solid, simple architecture and acoustic qualities create a very prayerful environment. The recitation in common of each canonical hour of the breviary constitutes the “backbone” of our daily schedule, as we shall see. The Dominican breviary is essentially the same as the one used in the Roman rite, but there are a sufficient number of differences to surprise (and exasperate?) more than one visiting priest! The choice of psalms recited is generally identical, but often the antiphons and responses are particular to the Dominican order. Other particularities highlight the specific character of Dominican life. For example, the fathers do not sit down during the recitation of all the psalms, as in the purely active congregations, nor do they stand the whole time as in the purely contemplative orders. They sit and stand alternatively with each psalm: it’s a reflection of the apostolic “mixed” life! Matins are immediately followed by the office of Lauds and a half-hour of mental prayer. This brings us to about 5:45. After the recitation of the Angelus, most of the fathers descend into the oratories of the crypt to celebrate their daily Mass. After Mass and about 15 minutes of thanksgiving, the fathers and brothers may take a quick breakfast in the refectory. Around 7 o’clock, most of the fathers and brothers are found in the community room named “The Most Holy Rosary” (thus named because of the antique portrait of Our Lady presenting the Rosary to St Dominic that hangs on the wall). There, they will see if there are any notices for the day on the bulletin board. They can also check their mailboxes. As silence is the general rule in the friary, these mailboxes get a lot of use. Writing notes is a way to communicate without disturbing the peace and quiet of the monastery. These precautions are a rigorous obligation until the bell rings at 7:30 to signal the end of the “grand silence”, during which it is strictly forbidden to talk. During the day (until the office of Compline, which marks the beginning of the grand silence), when two brothers need to speak to each other, they may go to a “locutorium” which is a room set aside for this purpose (from the Latin “loqui”, “to speak”). The bell at 7:30 is the official start of morning activities. For the professors and the clerical brothers studying for the priesthood, that means philosophy or theology classes. The course of studies is based primarily on the Summa Theologica of St. Thomas Aquinas, as exposed by the great commentators approved by the Popes and Tradition. In particular, much use is made of the monumental works of Reverend Father Garrigou-Lagrange o.p. (1877-1964), the illustrious anti-modernist defender of thomistic theology. For the postulants and novices, the classes are concentrated mostly on spirituality, liturgy, Gregorian chant, and the history of the Dominican order. They also have a class on the Acts of the Magisterium, taught by Archbishop Lefebvre himself – on cassette. For others, it’s time to work on an article for our doctrinal review Le Sel de la Terre, write a sermon, or prepare a spiritual conference for an upcoming retreat or pilgrimage. For yet another, this time will be used for his daily study of the Summa Theologica, which, far from being finished at ordination, must continue throughout the whole life of a friar preacher. This time may also be spent on spiritual reading, or to finish the daily half-hour of “lectio divina” (scripture study) that one was unable to finish before the bell. 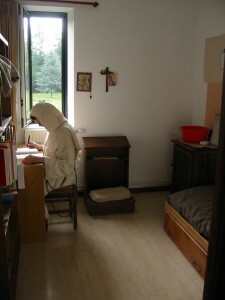 In any case, these two hours are spent quietly working or studying in our cells, a classroom, or the newly completed three-story library behind the convent. This life of study nourishes our contemplation and prepares us for our mission of preaching. May it be said in passing that the course of studies in preparation for the priesthood lasts at least six years. During this time (at least until the solemn obligation to recite the breviary which starts at the profession of perpetual vows), the clerical brothers are dispensed from part of the divine office. This provides them with the time necessary to pursue their studies without neglecting the other obligations of the religious life. For example, they do their scripture reading while the fathers recite Matins. At 9:30, the bell calls the fathers once more to the church for the recitation of the divine office. The canonical hours of Prime and Terce are recited, followed immediately by the Conventual Mass (or Mass of the community), at 10:00. The clerical brothers assist at this Mass, as well as the fathers if it’s a sung Mass. This is always the case on Sundays and, as much as possible, during the week. Life in the friary is truly centered on the Liturgy. By the attendance at daily Mass and the recitation of the divine office, we’re able to participate as fully as possible in the admirable succession of different feasts and liturgical seasons celebrated throughout the year by Holy Mother Church. This liturgical life is the most powerful means of sanctification at our disposal, and an infallible guide in our meditation. At the same time that the Conventual Mass is celebrated at the friary, one of the fathers goes to St. Joseph Monastery to celebrate the Conventual Mass of our contemplative sisters. After Mass, all return to their studies. At 12:15, the friars find themselves together again in the church for the office of Sext, followed by a short examination of conscience, the Angelus, and a procession in the cloister all the way to the refectory. During lunch, a brother reads from a book for the instruction of the whole community. As St. Augustine says in his rule (which is the rule of the Dominican Order): “Let not your palate be alone in receiving nourishment, but may your ears as well be hungry for the word of God.” How many books has this holy practice allowed us to enjoy, that we would never have been able to read otherwise? What’s more, the community aspect of this reading bonds us closer together and provides our recreations with ample material for thought-provoking subjects of conversation. Most often, we read from the lives of the Saints or Church history. Once a week we read the rule of St. Augustine, and on Sundays and feast days we listen to conferences and sermons of Archbishop Lefebvre. After lunch, the fathers process to the church chanting the “Miserere”. There, they recite the office of None while the lay brothers and novices finish the dishes. When these respective activities are finished, the community is reunited in the cloister for recreation; it’s about 1:30. If it’s necessary, the cantor leads a short repetition for the antiphons to be sung at Vespers, after which we leave for a half-hour walk in our woods. The friary is located just on the edge of town in a very quiet, natural setting, and yet we are only ten minutes from the train station. 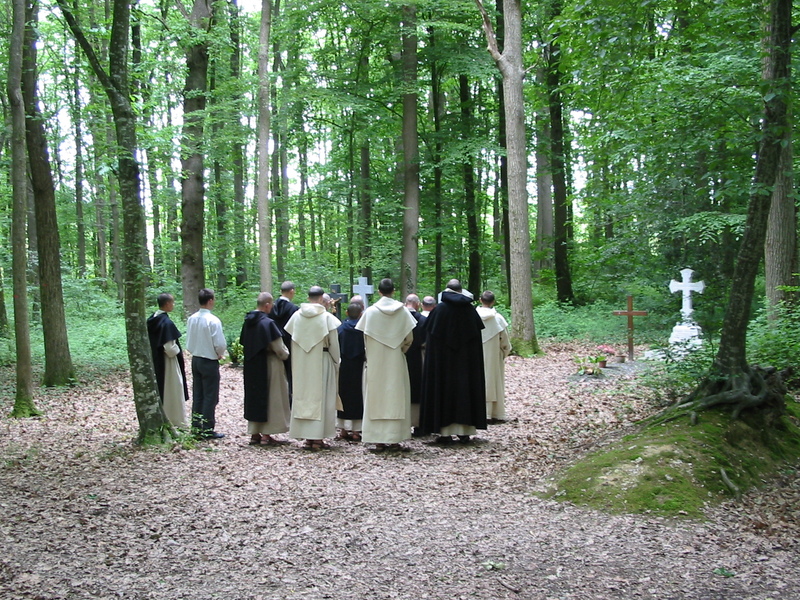 The walk usually includes a visit to the cemetery in the middle of the woods, where we can accomplish one of the devotions that characterize our order: prayer for the souls in Purgatory. Once a week we stay in the cloister in order to help out with peeling apples, cracking walnuts or any other work the brother chef has prepared for us. On Sundays, we leave the property to go pray at the nearby sanctuary of the “Field of Martyrs”, where 2,000 men, women and children were murdered in hatred of the Catholic Faith during the French Revolution. At 2:10, a brother rings the bell to signal the end of recreation, and all conversation stops – even if one is in the middle of a sentence. It’s time for another very important monastic observance: the midday siesta! Each one is free to retire to his cell to recuperate his forces for the second half of the day, to read, to write, to pray, etc… Others prefer to go to the church. Whichever way one chooses to spend this time, there is one necessary condition: silence. At 3:00, the familiar sound of the bell lets everyone know that it’s time for the recitation of the Rosary in the church. If it’s the month of May or October, each of the five decades is preceded by an antiphon sung in Gregorian chant. From 3:30 on, the afternoon is often spent in much the same way as the morning. The fathers work on the classes they are teaching or they continue the articles, sermons and conferences they must prepare. The clerical brothers study for their classes. However, this is also the time of day for sick calls, confessions, spiritual direction and other appointments. There may also be work to do in the library, the sacristy or elsewhere in the friary. One of the fathers is specially designated to oversee the work done by the lay brothers and outside workmen. It’s not a small task when one considers the many buildings on our property. Apart from the friary itself, there’s the library, guesthouse, elementary school buildings, garages, workshop, storehouses, and the “Priory”, a large 17th century building located next door that houses the boys’ high school. The elementary and high schools are another source of activity. The fathers provide the students with the sacraments and catechism classes (philosophy and doctrine for the high school boys), but as mentioned above, they are not directly involved in any other teaching. The friary’s role in these two works of education is one of spiritual direction. The fathers direct the two institutions “from above”, and orient them toward their goal (a truly Christian education), but the classes are taught by lay people. Once a week, the clerical brothers go walking for a couple hours in the country. It’s necessary to take a break once in a while from their studies. It’s also a good way to get to know the region and its many beautiful churches, especially for those who have left home and country to enter the friary. Such outings (and even longer ones) are more frequent for the postulants and novices. The lay brothers also have a monthly outing. The afternoon comes to a close at 6:00 with sung Vespers, followed by the Angelus. We then go in procession to the refectory for supper. However, twice a week, a half-hour before Vespers, the community comes together for a “chapter meeting”. 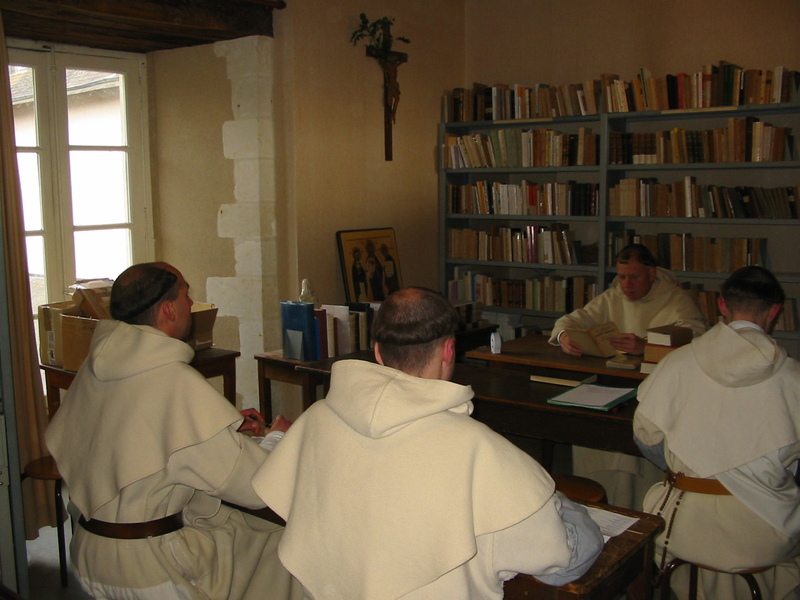 Assembled in the “chapter room”, all the fathers and brothers recite special prayers for our benefactors, and then sit down to listen to Father Prior give his spiritual counsels or announcements concerning life in the friary. It’s also the time for each one to recommend prayer intentions to the community. At the end, each brother takes his turn confessing any exterior faults that he may have committed since the last chapter meeting. It is not a sacramental confession, but simply a way of making public reparation for public faults that have disrupted the life of the community, for example, making noise during the grand silence, spilling water in the refectory, an error in singing the divine office, breaking a tool, or other such things. In former times, the religious insisted on having such chapter meetings every single day, so as not to deprive themselves of the precious graces that come from even the smallest act of humility. Supper is taken in the same manner as lunch, that is, while listening to a brother read from a book. However, the subject of the evening lecture is generally more spiritual in nature. After supper, there’s a recreation for the postulants and novices, and once a week, the fathers do the same. Otherwise, each brother takes care of last minute details for the day before going to Compline at 7:15. At the end of Compline, the community processes from the choir stalls to the statue of the Blessed Virgin Mary while singing the “Salve Regina”. At the words “Turn then, most gracious advocate thine eyes of mercy toward us”, all turn and kneel down while the hebdomadary (the father charged with officiating the divine office for that week) passes by to bless all the brothers with holy water. For the return to the choir stalls, an antiphon is sung in honor of St. Dominic: “O light of the Church, doctor of truth…”. There is then a half-hour of mental prayer before the brothers go off to bed. Lights out is at 8:30. Up until now, we have considered the friar’s peaceful life of study and contemplation in the cloister. What awaits him on the outside? Despite the specific doctrinal character of Dominican preaching (as explained above), the apostolate is surprisingly varied. First of all, without even leaving Avrillé, there’s an incredible amount of work to: weekly sermons for the parish; catechism, sermons and various religious activities for the school students (including the congregations of the Most Holy Sacrament and of the Blessed Virgin Mary); days of recollection for our third order members. There’s also a steady flow of visitors, whether it be university students come to study for their exams, old friends from around the world, or our neighbors from around the corner, curious to learn about the friary and the Traditional Mass. Outside of the region, we are often invited to preach retreats or parish missions in the schools and priories of the Society of St. Pius X, or to fill in for the Society priests when there’s a need. To give just a few examples from this past year, one of our fathers has been engaged for several months in a busy apostolate in the Society’s German district, another preached a series of Lenten sermons at the church of St. Nicholas du Chardonnet in Paris, and still others have preached parish missions or replaced priests in various chapels of Brittany. In addition to the third order meetings at Avrillé, twice a month there’s a meeting for our third order members in other parts of France (Paris, Strasburg, Lyons, Dinan). In the summertime, the fathers organize various activities. Because of the insufficient size of our guesthouse, these summer activities are usually held at the “Rafflay”, the convent of The Little Servants of St. John the Baptist, near Nantes in the West of France, and only an hour away from the friary. These devoted sisters put their conference rooms and beautiful chapel at our disposal, and do a wonderful job taking care of all the material aspects. First of all, there’s the doctrinal session called the “Journées Jean Vaquié”. It’s named after the late Jean Vaquié (1911-1992), a prominent anti-gnostic author praised by Archbishop Lefebvre, and who was a friend and collaborator of the friary until his death. Its purpose is to study the causes of the current crisis in the Church and in society, in order to find the right solutions. These sessions involve the cooperation of many other lecturers engaged in the same combat for the Faith: priests from the Society of St. Pius X and other traditional religious communities, professors, and professionals from various fields of expertise. Next, there are the retreats: Rosary retreat, retreat for couples, on Christian life, etc. Let it be noted that the Dominicans do not preach Ignatian retreats. The spiritual exercises were given by the Blessed Virgin Mary to St. Ignatius, but to Our Blessed Father St. Dominic, She gave the Holy Rosary! One could not find a more complete compendium of all the moral and doctrinal theology of the Catholic Church. It’s a sort of summary of the whole liturgical year and of our Faith. That’s why the Rosary is the general theme and inexhaustible source of our preaching material. Of course, we cannot forget the summer boys’ camp each year. It’s an occasion especially for the incoming students of the high school to get to know each other and some of the fathers from the friary. Then the Blessed Virgin opened the mantle with which She appeared to be clothed and spread it out before blessed Dominic. The mantle was so large that it seemed to cover all of heaven; and, under it, he saw a great multitude of brothers. Then blessed Dominic, prostrating himself, gave thanks to God and to Blessed Mary, his Mother, and the vision disappeared. How can I become a Dominican? Those interested in the Dominican life are most welcome to come for a visit. It’s much easier than many think, because it is not necessary to know French before coming (most of the fathers speak English). Female family members may be lodged at the monastery of our contemplative sisters, which is just next door. If one decides to stay for an extended period in order to try out his vocation, the boys’ high school provides ample opportunity for learning enough French to get by rather quickly. If you are more comfortable, you may contact us online. [footnote 1]These innovations were already characteristic of the life of canons regular assembled in diocesan “chapters”, such as the one in Osma, where St Dominic had received his formation. He took the innovation (or rather, the return to the Apostolic model) one step further by extending the field of action of each of his friars beyond the limits of a particular diocese.